The Drives & Motion Division of Yaskawa America, Inc., Waukegan, IL, has introduced the SGM7F line of compact direct-drive servo motors that deliver 4 to 35 Nm of torque in devices as small as 2.1 in. high and 5.3 in. dia. The compact sizes make it possible to apply the mechanical benefits of a direct coupling between a servo motor and a load in tighter spaces than ever before, according to Yaskawa officials, allowing machine designers to make automated machinery more compact, thus freeing up space on plant floors. 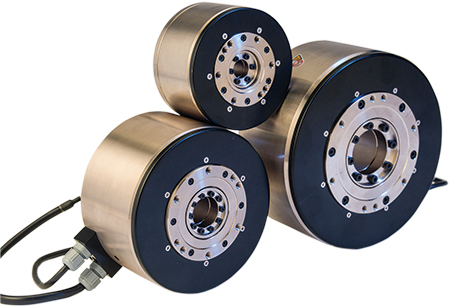 Direct-drive motors such as those in the SGM7F line allow for attaching a load directly to the servo motor, enabling a full range of motion control without the need for a shaft coupling or gearhead. SGM7F also offers a high torsional stiffness and virtually eliminates mechanical backlash, according to company officials. This yields an output that minimizes damage to components and maximizes positioning accuracy and repeatability. The SGM7F line offers eight different models to suit a range of industrial applications, including transfer lines, die actuators, electronic-parts assembly and dial tables.